Does prayer change God’s will? A fellow blogger (thetractorcab.wordpress.com) asked me an interesting question recently – does prayer change God’s will? Well, if prayer doesn’t change (at the least) God’s actions, then why pray? And If you pray, believing that prayer changes things, then what does it change? I think I know why some people doubt that prayer changes God’s will. They believe His will cannot change because He can’t change. A perfect being doesn’t need to change. But to say that prayer won’t change God’s will is to have a limited view of that will. What is God’s will? A monolithic structure? Is God tied to only one way of accomplishing His purposes? In his wonderful, concise analysis called The Will of God, Leslie D. Weatherhead makes more sense on this issue than most writers. He says the will of God h as many facets: God’s “intentional will”, His “circumstantial will” and His “ultimate will”. God’s original intent (will) was that mankind live in a perfect paradise in complete harmony with Divinity. But Satanic evil, along with man’s sovereign choices, hijacked that will. So now God works from His “circumstantial will” – His will as adjusted within a universe now corrupted by toxic evil. As an example, Weatherhead mentions illness. Why do we fight with all our prayers and medical skill against illness, and then claim it was “God’s will” if the person dies? Were we fighting God’s will all along? It was never “God’s will” that the world be swallowed up in sickness, death, suffering and evil, but now that it has been, His will works to reverse the curse. Simple example: King Hezekiah became ill (not God’s intentional will from the beginning) and prayed. He was healed (God’s circumstantial will). If he had not prayed, he would not have been healed. (See 2 Kings 20). God’s “will” waited on Hezekiah’s will. When he made his choice to pray, God’s will acted. Yes, God’s “circumstantial will” – in which we now exist – can be changed by prayer… by prayers that change His working in particular situations where humans have a choice. What do you think? Does prayer change God’s will? Have you ever experienced it? 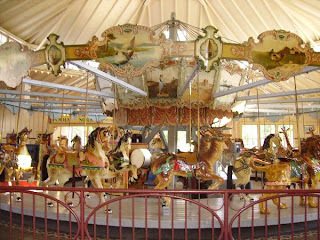 How do you dismount a moving carousel? I wrote about a fascinating creature called an Ichneumon in my book, Why God Waits For You To Pray. This small weasel-like creature can murder poisonous snakes up to a yard long, even after being bitten repeatedly. So, how does this tough little character survive? Well, it never attacks a snake unless he’s near a certain plant whose leaves produce anti-venom sap. When bitten, the ichneumon rushes to the plant, nibbles the leaves, recovers and then attacks the snake again. I’m trying to pattern my prayer life after that animal’s survival tactics. You see, when I’ve been too involved in life, in the problems of people and ministry, in combating the Serpent, etc. – then I need a prayer-break. I’m not much good to anyone when I’m tired, discouraged, beaten down and generally overwhelmed by too many demands. Sometimes I even find myself avoiding people because of the drain on my spiritual electrical system. And sometimes I’m like a kid on a carousel who wants off, but can’t jump because it’s still moving. I have to wait… wait for those times when I can retreat into prayer – that sublime land where all cares melt in the glow of the Father’s warm acceptance. Jesus had the same need. In the middle of crushing demands on his time, when news about him had spread throughout the land and crowds tugged at him to heal their kids and lead them out of Roman slavery, the word says, “But Jesus often withdrew to lonely places and prayed”. (Luke 5:16 NIV). And the Lord demanded the same of his own disciples: “Then, because so many people were coming and going that they did not even have a chance to eat, he said to them, ‘Come with me by yourselves to a quiet place and get some rest. '” (Mark 6:31 NIV). Jesus knew that a warrior’s time spent sharpening his sword isn’t wasted. In the battle, the time-investment pays off. That’s why he told the disciples, “Pray that you will not fall into temptation”. (Luke 22:40 NIV). Anyway, I hesitantly agreed to go, but I had enough good sense to pray first. And as I prayed for this man, whom I barely knew, the tears inexplicably began to flow. I wanted him to find his peace in God. And it mattered to me. He and his wife seemed happy to see me. They soon invited me in, where we had coffee and I popped the question. His refreshing honesty caught me a little by surprise (preachers regularly hear some quite creative excuses), but his answer was in character for a tough, no-nonsense working man like Jack. In response to his candid remark, I said, “Did you know that you can be certain that you’re going to heaven?” Then I read 1 John 5:13 to back up my point. He agreed and wanted me to pray (but he wasn’t ready for me to leave, yet). When I finished praying, I looked up to see tears flowing down Jack’s weather worn face. Jack was a different man from that day forward. After that, he never missed an assembly of the church, and radiated a joy noticed by all. He died six months later, assured of his place with Jesus. The gentle hammer of prayer had hit its mark – on both of us.